Universal Sports Armband for all Phones. Exercise Arm Holder for Running, Fitness and Gym Workouts (iPhone X/8/7/6/Plus,Samsung Galaxy S9/S8/S7/S6/Edge/Plus & LG,Huawei,Google,Sony & More). Medium by Revere Sport at All Company Mobiles. MPN: Louche-BM(US). Hurry! Limited time offer. Offer valid only while supplies last. DESIGNED FOR COMFORT!!! This is the most secure armband on the market, designed to hold your phone so you don't even notice you have it with you. This is the most secure armband on the market, designed to hold your phone so you don't even notice you have it with you. The lightweight material creates a snug, No Bounce extra secure fit!! Allowing you to exercise with no distractions and no discomfort. X-Small : 7.4" - 8.5"
Small : 8.5" - 11.6"
Medium : 11.6" - 14.2"
Large : 14.2" - 16.5"
Extra Large : 16.5" - 18"
FITS YOUR PHONE & MORE : Never leave anything behind with the stretchy armband that can hold your phone, keys, cash, credit cards and even a nutritious snack. Whether your phone is 4"or 6.5", it will fit inside even with your phone case ON. SMALL - LARGE ARMS : Finally, a phone armband that you never have to readjust or worry about slipping during physical activity. The comfortable material hugs your arm like no other armband you've used before. Please measure around your bicep circumference (un-flexed) for a guaranteed fit. X-SMALL 7.4" - 8.5", SMALL: 8.5" - 11.6", MEDIUM: 11.6" - 14.2", LARGE: 14.2" - 16.5", X-LARGE 16.5" - 18"
LIFESTYLE DESIGN : The discreet, stylish design makes this the perfect phone holder for an active lifestyle. 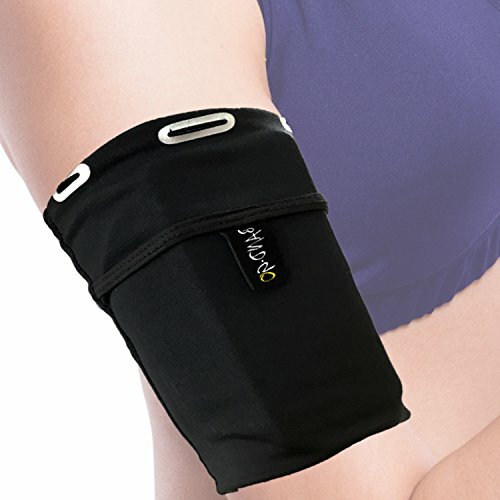 If you enjoy running, weight lifting, hiking, dog walking, gardening or days out at the theme park, then this Armband is perfect for you. LIFETIME WARRANTY : Here are RevereSport we care about our customers and we only provide the finest quality sports armbands. Feel secure when you purchase knowing you are covered by our 30 Day money back Guarantee and our LIFETIME replacement Guarantee.